A new play opened 29 March at The Cockpit Theatre in London. 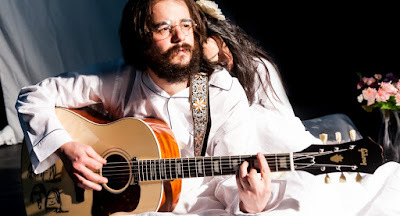 ‘Bed Peace: The Battle of Yohn and Joko’ is the brainchild of Rocky Rodriguez Jr and is a joyous as well as tempestuous exploration of the burgeoning political awareness of John Lennon under the gentle tutelage of his newly-found soul mate, Yoko Ono. 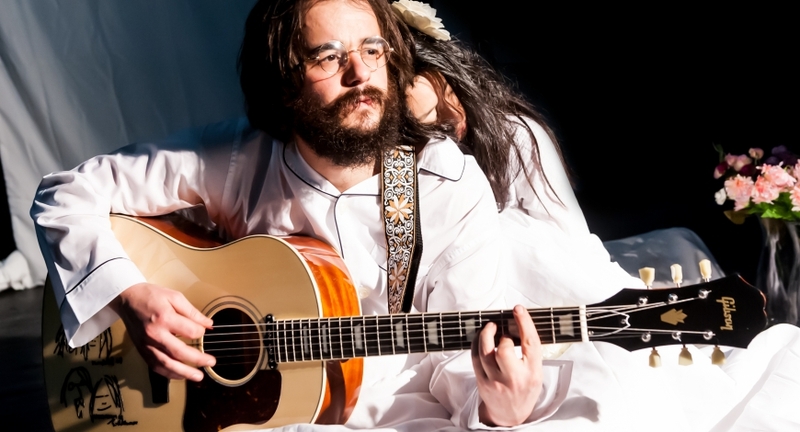 The core focus of the play is the very familiar May 1969 Bed-In for Peace in Montreal. As a prelude to this event the playwright artfully weaves in a narrative of current events, expertly delivered by four supporting actors. One actor in particular stood out. Amelia Parillon delivered an impassioned diatribe, living the pain of a young black woman in the 1960s. Another actor presented a disappointingly stereotyped view of the average white middle American who really couldn’t see what the problem was – this view overlooks the huge number of white middle Americans who DID know what was going on and DID try to change things for the better. Still, it was a powerful opening that encouraged a ‘rage against the system’ within the audience psyche in preparation for the events to come. Rodriguez intriguingly surmises that the impetus for John and Yoko’s peace campaign was Yoko’s miscarriage in November 1968. It was while Yoko was in hospital, with doctors attempting to save her unborn child, that the couple recorded its heartbeat; later released as Unfinished Music 2: Life With the Lions. The original recording plays during this performance. Yoko, passionately played by Jung Sun Den Hollander, demands of John why he can’t cry over the death of their child and pleads with him ‘to do something’ to improve the world. He asks her to marry him, they do, now over to the Bed-In. Once again, Rodriguez skillfully mixes in scenes intended to not only inform the audience of historic events but also to inspire an emotional response. I felt John’s frustration, his hurt, his anger, when, from a ‘bag’, he attempts to give a press conference about Yoko’s ‘Total Communication’ and all they want to know is what The Beatles are up to. Yoko is there all the way, encouraging John gently and persistently to allow himself to feel that pain. Next, John and Yoko in bed speaking with the students protesting at People’s Park in San Francisco. The actor playing John, Craig Edgley – he really develops his performance so well as the play progresses – speaks John’s words over the original phone recordings. The play ends with the creation of ‘Give Peace a Chance’. I thought this was ‘too long for a short focus’ but involving the audience in its creation was inspired. We all closed the show together, stamping our feet, clapping our hands and singing our hearts out. Rodriguez, interestingly a LIPA graduate, is a playwright of great talent. I shared this experience with a friend who is not such an intense Beatles fan but who is very knowledgeable of the events of the time – he was impressed. ‘Bed Peace: The Battle of Yohn and Joko’ is on at The Cockpit Theatre, Marylebone, London until 28 April. BBFC membersare offered a discount.